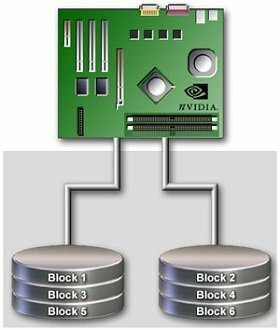 RAID is the acronym for Redundant Array of Independent Disks used to organize multiple physical hard drives in computer to function as a logical drive. RAID allows a higher data availability in case of failure of individual hard drives. RAID is an practical implementation of Storage Virtualization. Unlike the usual target used in computer applications to avoid redundancy, for RAID systems, redundant information generated purposefully, so that the failure of individual components of the RAID as a whole retains its integrity and functionality and can be used for replacing the failed component by a process. This redundancy should not be compared with a backup. The variants of RAID 0 and RAID 6 was only coined later by the computing industry. Since 1992, the standardization is done by the RAB, consisting of about 50 manufacturers. The further development of the RAID concept led to increasing use in server applications that leverage the increased data reliability. The issue of cost savings adds with it. The ability to switch to such a system, individual drives in operation, corresponds to the acronym in use today: Redundant Array of Independent Disks. The operation of a RAID system requires at least two hard drives. The hard drives are used together to form a composite, more powerful drive, virtually as a single unit. Hardware RAID is the interaction of the hard drives from a specially designed hardware module. Hardware RAID controller is usually located in proximity of the hard disks. In the data center environment it is more common to opt for a separate housing. The external systems are often referred to as DAS or SAN or NAS. Professionally set hardware RAID implementations have their own embedded CPUs, additional cache memory and thus offer the highest data output and relieve the main processor. Software RAID is the interaction of the hard disks on the software side. Most modern operating systems like FreeBSD, OpenBSD, Apple Mac OS X, HP HP-UX , Linux, Microsoft Windows, Sun Solaris are able to support Software RAID. This Article Has Been Shared 3963 Times! Cite this article as: Abhishek Ghosh, "RAID or Redundant Array of Independent Disks," in The Customize Windows, August 14, 2012, April 24, 2019, https://thecustomizewindows.com/2012/08/raid-or-redundant-array-of-independent-disks/.